The full description of the enchantment Konahrik's Privilege is "When low on health, has a chance to heal wearer and damage nearby enemies, or summon a powerful Dragon Priest defender". The dragon priest summoned by the mask's enchantment counts as a conjured creature. 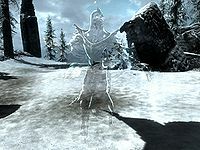 It can cast Incinerate, Thunderbolt, Icy Spear, Frost Cloak, Lightning Cloak, Dread Zombie, Greater Ward, and Conjure Storm Atronach (though its storm atronach does not count as yours). After the spell ends, the dragon priest will vanish in a cloud of black smoke, sometimes leaving behind an unlootable ash pile. Konahrik means "Warlord" in the tongue of the dragons. 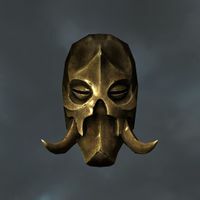 Konahrik has the highest base armor rating of any helmet in the base game, surpassing even the Daedric Helmet. From level 45 onward, MiraakDB has the highest armor rating. Placing Konahrik on its pedestal at Bromjunaar Sanctuary will remove any bonuses it gained from tempering. This page was last modified on 31 March 2019, at 16:29.